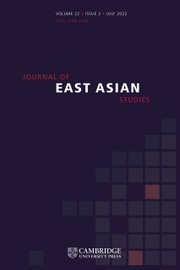 The Journal of East Asian Studies is devoted to publishing cutting edge social science on East and Southeast Asia. The journal is interested in work that combines theory, novel empirical contributions and engagement with the major substantive issues facing the region. The JEAS publishes primarily in the fields of international relations, including both international political economy and security studies, and comparative politics. However, we welcome interdisciplinary work and contributions from sociology, applied economics and business studies as well. The journal is also open to roundtables on important new books on the region, review essays and shorter research notes. SSCI indexed, the journal prides itself on a strong peer-review process.